The latest book by David Sedaris is called When You are Engulfed in Flames. It’s a quick read, funny enough, and designed to please his fans looking for material similar to his previous books. But honestly, I was wishing for him to cover some new territory. Also, the rhythm for each chapter – a separate story – is a bit overused: start out the chapter with a fact, followed by several seemingly non-related ideas, and the viola back at the starting fact to close down the chapter. There were stories where interesting issues are raised e.g. perceived roles in relationships (All the Beauty You Will Ever Need) or ostracized people (The Man in the Hut) where I was looking for a little more heft but it wasn’t there. 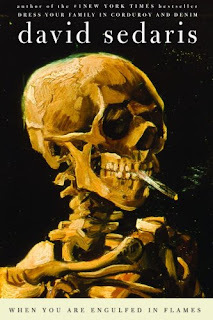 The image on the jacket cover is Vincent Van Gogh’s Skull with Burning Cigarette (1885-6).